Delmar- Rodger William Joly, passed away on, Friday, November 30, 2018. He was the beloved son of the late Elizziebelle Craft Dayter Blau Joly and Henry Joly. He was the most precious brother of Justine Tina Blau Cook. He was predeceased by his sisters Elizziebelle Barbara Blau Michela, Eleanor Luella Blau Eccles and his number one sister mother Sue Carol Blau McCcue who passed away in 2016. He was also brother to, Carl Blau of Greencastle, Indiana. He is also survived by his niece Christina Orokos Lifshey (Rob) and Geoffrey Orokos (Andrea) and their five children. 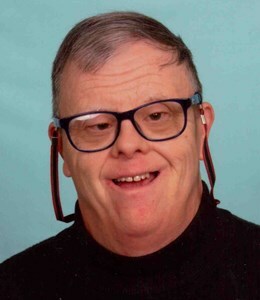 Rodger attended the Sunshine School in Albany and worked at the Thruway Authority and the ARC. Rodger worked with his sister Sue at the State University Construction Fund and the Heldeberg Nursery and they also, volunteered at a local food bank. Rodger loved bowling, golfing, music, dancing, traveling and eating out. He was a joy to be with and best person to hug. Over the years, Rodger made many, many beautiful hook rugs. Rodger’s sister wants to thank the following individuals who enriched his life even though they did not realize how much their small deeds meant to him; the late Dr. Thomas Riedy who cared for Rodger from the time he was born until his passing in his 40’s, the late Vince Powers who ran the Cerebral Palsey league at Sunset Bowling Alley, the Hoffman family from the Sunset Bowling Alley, the Martel’s who owned and operated the Heldeberg Nursery, Gloria and Paul from Mill Road Acres, Nick, Ginny and Peter of the Village Deli, “Dony Elvis” (Donnie Romaines), Caleb, Amy, Miguel, and Mike Rodgers personal trainers at the YMCA as well as the entire staff at the YMCA, Nashema Scott and Trimeka all the staff and other clients from the Newgate Day Program, all the lovely volunteers from the Bethlehem Seniors who transported Rodger from home to Newgate, Frank from Frank’s ice cream on Shaker Road, James McCue who spent many hours with Rodger betting at OTB, visiting the Saratoga Race Track and playing golf with him, Dr. Graham Fitz, Ms. Pam, Sandra Paradis, Mr. and Mrs. Edwards, everyone from the Sunshine School, Mike Pitt from the Wolf Road Arby’s, Destiny and all the staff at the Eddy Daybreak, Jean Dearstyne from “flower camp”, Lori Hazen the home health aide from heaven, Rocky and his late father from the Golden Cue on Central Avenue and finally Christina and Geoffrey and their families. Services were private and held on a previous date. Add your memories to the guest book of Rodger Joly.